Journaling is something I always have good intentions to do, but my follow through is less than stellar. Then a couple of weeks ago a blog I follow (Lil Boo Blue) shared that she was going to be starting The Lil Journal Project. Each day she would share a different topic to journal about. And it wouldn't be just writing... there would be the option to draw and sketch. YAY! Colored pencils. Sharpies. Paint. FUN! Topics of things like drawing a picture of your first classroom that you have a memory of. Listing the vehicles you've owned and the memories associated with each car. Today's topic is remembering books from your childhood. Topics I wouldn't think about writing about, but a great way to dig deep in my memory and record some of it. This sounds right up my alley! I liked the idea of being prompted to write about different things. I liked the drawing idea. But my good intentions were as far as I got with this. While picking up some stuff at Walmart yesterday I saw a sketch book on an end cap by the craft department. A small book, plain cover. Unlined pages (I hate lines!). $6. Perfect for the project! I threw it in the cart and realized my intentions were moving towards reality. Last night I decided to dress up the outside and made a journal cover. I googled for some ideas on how to make a journal cover and ended up using the directions from Artquiltmaker blog. Pretty simple and straightforward. I knew I wanted to use some of my black linen and to do leaf shaped applique on the front, plus there had to be perle cotton stitching. While poking around on the internet for journal covers, I somehow came across the idea of putting different threads (like perle cotton) on your bobbin (while still using regular thread on top) when it comes to quilting a project. I was intrigued! With a bit more research, I followed the advice from www.threadsmagaine.com. The images on their site are really neat - So many cool things you can do with bobbin work! I pulled out the Perle Cotton 8 I had, put it on a bobbin, increased the stitch length a bit, marked my lines on the interfacing on the back, and gave it a go... all I can say is AWESOME! Sort of that hand-stitched look, without having to commit the time (that I didn't have!) You can see a bit of the top thread, so make sure you pick something that either matches or coordinates with your bobbin thread. 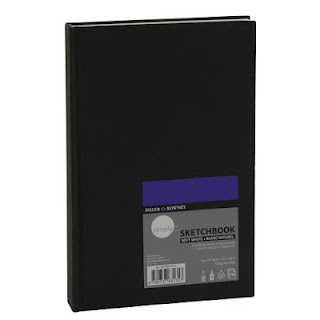 When I got it done I couldn't wait to dive in and start writing and drawing in it. I loved the suggestion to just open the book and start writing wherever. Very freeing. That starting at the front can seem too daunting! Journaling is going to become a part of my morning routine. The school start time changed quite a bit this year which now gives me almost 2 hours at home in the mornings after everyone else leaves for work and school before I have to leave. (I used to have 15 minutes!) A perfect time to enjoy a cup of tea and journal in my new snazzy covered book! Cool about the journaling - enjoy! I did something similar but different that I finished this year - 52 lists in 52 weeks. Very fun and though-provoking. And thanks for the info about bobbin sewing - had never considered that! This is so interesting, because I'm doing just the opposite--No. 8 on top and regular thread in the bobbin, size 100 needle. So far it's working well. But it didn't work for my friend at.all! Not even a single stitch. I notice you are from MN. My husband is from southern MN. So pretty! And unique with the perle cotton in the bobbin. Lovely! Great idea to use the perle in the bobbin - will have to try it!